Maintain employee records, input payroll information, process payroll calculations, print payroll checks and reports with the Visual Scrap Payroll Processing and Reporting module. 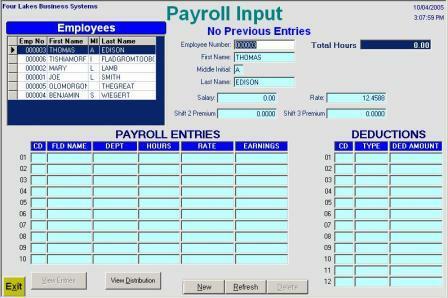 Payroll input and resulting output totals can be distributed to different department code for labor costing by department. You can set up various deductions for insurance, credit union, pension or other deductions. All the current, quarter to date, and year to date information for updating general ledger and government reporting is maintained by the system. Reports include employee master list, payroll input report, payroll register, check printing, check register, payroll distribution reports, and monthly, quarterly, and year to date reports.